The bishop has the same value as the knight. Its value is greater then that of the pawn but smaller then those of the rook and the queen. 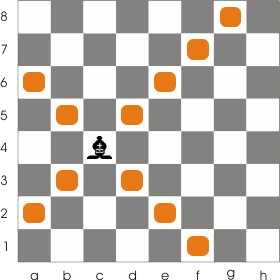 At the beginning of the game each side has two bishops, one placed on a dark square and one on the light square just like in the following game. 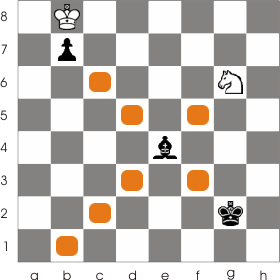 The bishops move on the diagonals. They will always move on diagonals of the same color as the color of the square that they occupy at the beginning of the game( This is common sense : because they can move only on the diagonal, they will never leave the initial color). Watch the example below to see how the bishop can move. Just like the rook the bishop can't jump over pieces. The bishop captures pieces the same way it moves. More specific it moves along the diagonal until it reaches the enemy piece then takes its place and gets it out of the game. 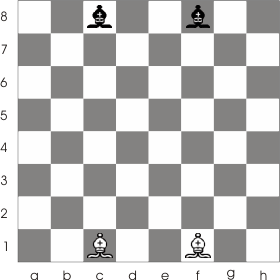 In the game above the black bishop can capture the white knight at g6 by taking its place.